Here at Direct Pet Supplies Perth we have all your reptile thermostat needs to keep your scaly friends temperature just right. 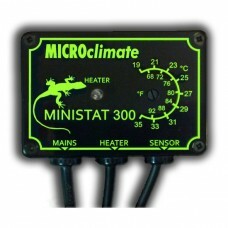 URS Microclimate Ministat 300 Ministat 300 is an on/off Thermostat controlling up to 300 watts of heating devises. Fully wired with a probe for easy installation. No Electrician Needed. This range of thermostats are ON/OFF thermostats for controlling up to 300 watts of ANY heat source. They are fully wired with a probe attached. All microclimate range of thermostats are high quality and made in the UK. Unit Size : 75 * 52 * 27 mm ..
URS Thermostat Plus Thermostat Plus is an on/off thermostat with a stainless steel probe. Ideal for Brooding Birds. Temp range between 0-40°C. Fully wired, No electrician needed. The Thermostat Plus is designed to control heating appliances in dry environments and comes ready to use (no electrician required). Temperature is measured by the probe which signals the thermostat to simply turn on and off as required to maintain desired temperature. The stainless steel probe..